Lucky me, the A-to-Z Challenge has us landing on G for Easter Sunday; is there a better topic to discuss today than the Gospel? 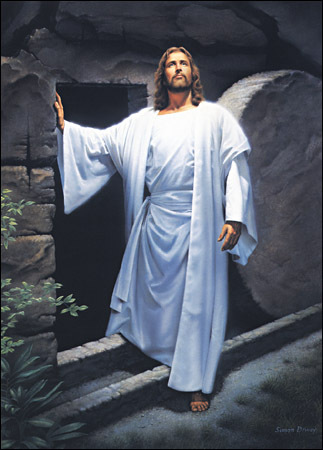 Disclaimer: I'm LDS, so my views on Easter will be from that perspective. God has a plan for us. A plan to allow us to be happy and find peace and joy in this life and the one that follows death. By believing and following Christ, we can find a happiness that no other thing on Earth can provide. Satan has another plan for us, which is to be just the opposite. Satan would have us be miserable like himself through the vain pleasures of the world by disobedience to our Father in Heaven. Through God's love, he gave us His son, Jesus Christ, to give us what we need to in order to be happy. Jesus set an example for us on how to live a life of peace. He then gave us the atonement, to help us overcome the pains and miseries of this world. Whether it be obtaining forgiveness of our sins, finding peace and comfort in our life, or finding the strength to endure to the end, the atonement is there for us to enrich our lives. He also gave His life as a sacrifice to overcome the enemy that no person could escape: death. Christ has risen and provided an avenue for us that we may one day walk beside Jesus Christ and our God again in perfected, immortal, and eternal bodies. Not only that, but that we may live eternally in God's presence with our friends and loved ones. Today is a great day and I love reflecting on the love that God and Jesus the Christ has shown for us. May peace be with your family today. May you grow closer to Christ. May we all enjoy the blessings that the Gospel (from the Greek word meaning "Good News") of Jesus Christ has given us.